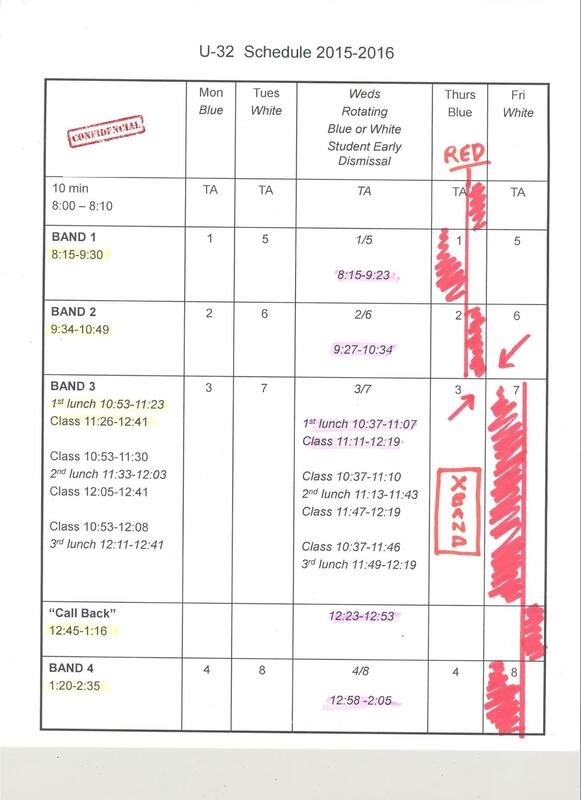 It won’t be until semester two, but the long-rumored “red days” are indeed being added to U-32’s weekly schedule. Currently there are four versions of the proposed schedule accessible on the help menus of Naviance and the Enriching Students software. It’s not clear which of these best describes the way “red days” will actually work; however, each version of the schedule involves a dial-up link to a government satellite that will announce passing times over the intercom. Shawn Doyle, in the technology office, says the fiber optic cables and modem have been ordered and should be installed by the end of the school year. In states where “red days” have already been implemented there have been issues with “interruption of service,” resulting in outbursts of uncontrolled behavior by students and teachers. This happened most recently in Maine, where three students were injured during an unplanned, extended outdoor lunch period. The new schedule has also been controversial for how it was passed into law, tacked on as a last-minute amendment to the Obama Lunchmeat Portioning Act of 2012 by senators from Delaware, home to many of the major corporations in the growing educational software industry. Students and staff can swipe their school ID cards to access their username and temporary secure-login passwords at the cafeteria’s checkout register, and accounts should actualize sometime this winter.